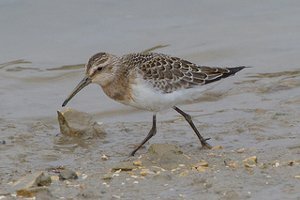 In winter the Curlew Sandpiper has dark back feathers edged with pale buff, it's breast is a pale peachy buff and it's underside is bright white. Most often seen wading in deep water to feed, unlike the Dunlin or Knot with which it can be confused. 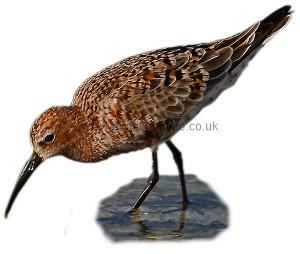 The Curlew Sandpiper is an elegant bird which frequently mixes with flocks of other waders. The breeding success of the Curlew Sandpiper depends closely on the number of Arctic Lemmings, as when they are scarce, Arctic Fox feed on the chicks. 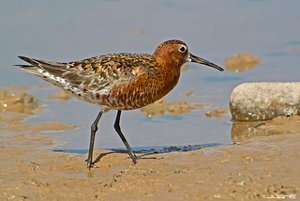 In summer plumage the Curlew Sandpiper has brick-red head and underparts. Not unlike a Knot, but the long legs, curved bill and long neck should confirm identity. Note the distinct eye stripe, the buff edged back feathers and the peachy buff breast. The curved bill is not so obvious in this image. The Curlew Sandpiper is not known to nest in Europe. It breeds in a small Artic region in N Russia. Major migration route is from the nesting ground to India and Africa via Europe. Some birds remain in Europe for the winter. There are usually around 700 sightings per year in the UK, mainly in the autumn when they can turn up at almost any coastal location with a suitable habitat. Prefers shallow fresh water and the muddy edges of coastal pools. Curlew Sandpiper's in both winter plumage and summer moult. 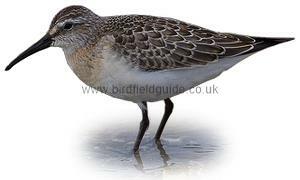 The long legs and curved bill of this bird separates it from a Knot in summer plumage. Note the light feathers around the eye and base of bill. 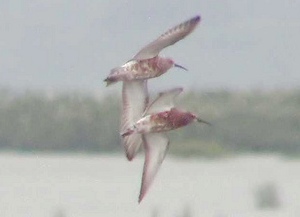 A rare photograph of two Curlew Sandpipers flying in summer plumage, note the distinctive bill and the rich red underside. Also note the plain white underwing.